Canon Pixma MG6850 is a 5-ink multifunction inkjet printer with the capabilities to connect with smart devices to scan, copy and print. The shiny black device is designed with a user-friendly interface to make printing at home an easy and enjoyable task. The inkjet printer weighs 6.5 kg which is good for home users, especially when they need to move the device frequently. The dimensions correspond to 45.5 cm in width, 36.9 cm in depth and 14.8 cm in height. The device comes with a large 7.5-inch colour touchscreen and a big-size control panel that makes navigation easy and fast. It prints excellent quality photos with a resolution of 4800 dpi. The print speed for mono goes up to 15 ipm whereas for the colour it goes up to 9.7 ipm. Among the smart features, the printer is able to print and scan photos from Cloud and mobile devices with the help of Canon apps. It also provides a wireless connection with WiFi Direct for printing. Besides, 5 individual Canon Pixma MG6850 Ink Cartridges are available with a pigment black dedicated for sharp text. Canon Pixma MG6850 Printer offers printing, scanning, and copying with a small footprint. It enables users with multiple print options via Cloud and mobile devices. The print quality for photos is excellent to an extent to impress professional photographers. Even the Canon Pixma MG6850 Ink Cartridges are available in XL size to reduce costs in long-term. Finally, offers a compact solution for home users. What to do when no ink comes out from Canon Pixma MG6850 printer? Open the operation panel and check the ink status (ink lamp), whether the ink cartridges are expended or not. If the ink has run out, install new Canon Pixma MG6850 ink cartridges. Make sure that the orange tape or the protective film is covered off to expose the Y-shaped air hole. If you see the orange tape on the ink tank, peel it off. Try to print the ‘Print Quality Check Sheet’ and clean the Canon Pixma MG6850 ink cartridges nozzle or clean the printhead, if required. Make sure that the protective layer on the ink tank is removed. If not then peel it off. (If the above step does not work)Turn off the printer and perform print head deep cleaning again after 24 hours. Make sure that there are no foreign particles present at the print head nozzle as it can cause no print issue during the printing job. If you still face the issue and print head deep cleaning does not resolve the problem, the print head may be damaged. Contact your nearest Canon service centre and request a repair. How to improve the print quality for my Canon Pixma MG6850 printer? Use good quality Canon Pixma MG6850 ink cartridges. Check the printer driver software. Check for the appropriate paper type from the Media drop-down list. Check the paper quality. It is always recommended to use non-wrinkled smooth paper. Q. I need a compact printer that is capable of printing good quality graphics and has various other functionalities as well. Will a Canon Pixma MG6850 printer be suitable for me? A. Yes, a Canon Pixma MG6850 printer is an excellent choice for you. This printer comes with scanning and copying functionalities as well. It also has Wi-Fi support and can print images directly from your memory card. It is capable of printing crisp texts and high quality graphics. Q. 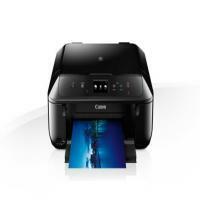 Are Canon Pixma MG6850 printers capable of borderless printing? A. Yes, you can print borderless images using the MG6850 printer. Please note that only the following paper sizes are recommended for borderless printing with this printer: A4 size paper, Letter paper, 20 x 25 cm, 13 x 18 cm, 10 x 15 cm. Q. I wish to choose the best quality compatible ink cartridges for my Canon Pixma MG6850 printer so as to avoid any damage to the printer. A. Our compatible Canon Pixma MG6850 ink cartridges are the perfect choice for you! We provide our customers with best in class compatible ink cartridges that are factory tested under ISO standards, so that the ink cartridges work smoothly with your printer. Q. Is it possible to print from multiple devices while using the MG6850 printer? A. Yes, you can connect the Canon Pixma MG6850 to multiple computers and mobile devices through wireless connectivity. Just make sure that the printer and the device are connected to the same network. Q. I am not a frequent user of my Canon Pixma MG6850 printer and sometimes the ink cartridge dries up before I get the chance to use it. Do you provide individual ink cartridges as well, so that I only have to order the Canon Pixma MG6850 ink cartridge when it is running low? A. Yes, we provide individual Canon Pixma MG6850 ink cartridges of all colours. You can place an order for any of the colours as and when required, to avoid any wastage. Q. How many pages can this printer handle at one time? A. Canon Pixma MG6850 printers can handle up to 100 sheets of paper at one time.